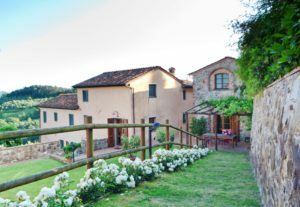 Join Cathy Daley and like-minded people for an immersion into “La Dolce Vita” – the sweet life – in the Tuscan countryside. We will have private use of the estate, including three Tuscany cottages with a social center, outdoor saline pool, Turkish Sauna, fully equipped indoor and outdoor Yoga spaces, and a poolside terrace for dining. You’ll have plenty of time each day to explore the local villages – by foot or by bike, stroll to a centuries-old winery on the “Strata del Vino” (the wine road), take a Tuscan cooking class, receive a massage at the spa, or simply unwind by the salt-water pool. Together the group could take a daylong excursion to Cinque Terre, The Italian Riviera. 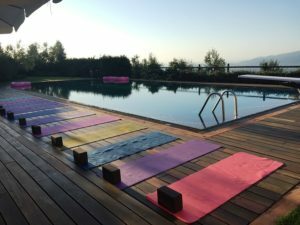 Relax in the comfort of the Tuscany countryside all while immersing yourself in yoga and self-healing. Enjoy local, culinary wonders prepared by our personal chef and served in the traditional family style. This trip will make memories that last a lifetime! 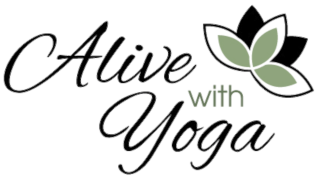 THIS IS A PREMIER YOGA ADVENTURE- from the accommodations to the food, drink, and activities planned. It is reasonably priced due to the cost of traveling to Italy. This all-inclusive experience will be unforgettable fun and you will be well taken care of. *Room Types A & B can be converted to single occupancy for an additional fee. Please inquire for pricing. Note: Not all bathrooms are in the suite. Some are outside the room, but only for that room. Pay in full and get $200 off! A $500 deposit reserves your spot. The second payment of $1,000 due October 1st, 2019. Final Balance Due Feb 1st, 2020. Initial deposit is non-refundable. If you paid in full and need to cancel before February 1st, 2020, we will refund you all payments outside of the deposit and a 6% transaction fee. Refunds will be considered if there is a person to take your spot, minus the deposit and a 6% transaction fee. Initial deposit is non-refundable. Travel insurance is recommended. Day 1: Vacation begins at 4 pm. Late afternoon yoga, welcome dinner. Day 2: Morning yoga. Free time to relax by the pool, get a massage or explore the Tuscan countryside by foot or bike. Afternoon yoga. Day 3: Morning yoga. Option to do a guided tour of Lucca or free time to relax by the pool, get a massage, or explore the Tuscan countryside by foot or bike. Optional Puccini Opera in Lucca – Dinner out. Day 4: Morning yoga. Walk to a nearby vineyard, including wine tasting & private vineyard tour. Day 5: All day excursion to Cinque Terre. Lunch out. Late dinner at the Villa. Day 7: Morning yoga. Free time. Final evening dinner party – Wood Fired Pizza and Prosecco! Day 8: Breakfast and arrivederci at 9:30 am! What’s Not Included: International airfare, Transportation to Lucca, Applicable Tourist Visas, Incidentals, Travel Insurance; highly recommended, Airport taxes, Airport transfers, Tips or gratuities, Optional excursions, tours, admissions, massage. 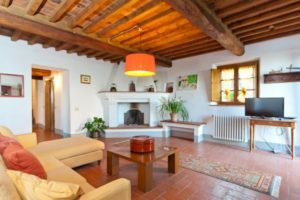 We’ll stay in a beautifully restored 17th-century stone farmhouse outside Lucca in the Tuscan hills. 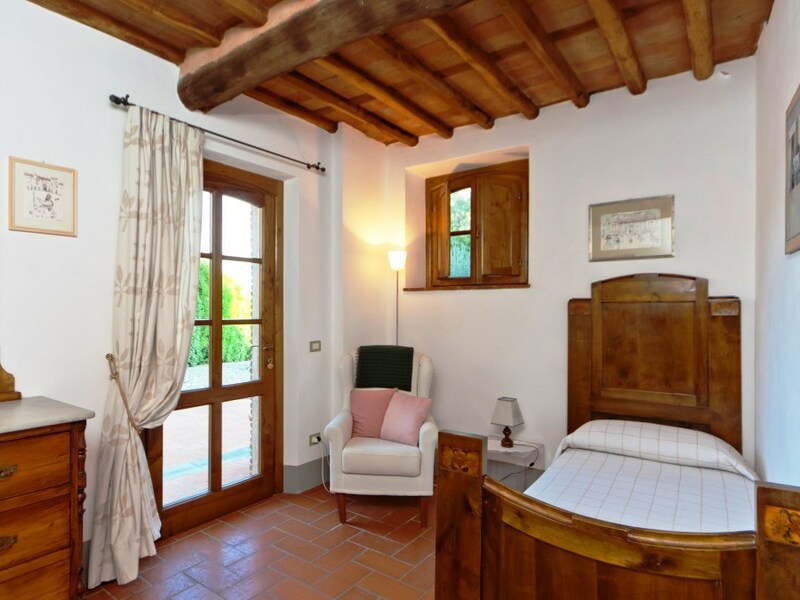 Simple, stylish, and comfortable rooms overlook olive groves, fruit trees, and the verdant surrounding hillsides. Views of the sunset and sunrise are stunning. Full use of common spaces including the swimming pool and the fully equipped yoga studio. We may include in our vacation a day trip to the breathtaking Cinque Terre. These five coastal villages are embedded in rocky cliffs along one of Italy’s most scenic stretches. For those who are hikers, it is possible to spend a day walking and climbing between these beautiful villages and enjoy the spectacular scenery along the way. For others, you can still enjoy walking the more gentle trails, spend time swimming at the beach, exploring the villages, and sampling some of the local delights. Also included is a wine tasting excursion to a bio-dynamic winery. We go by foot along the “Strada del Vino” (The Wine Road) to take in the beautiful scenery. After a tour of the winery and gardens, we taste their excellent wines. The estate also produces olive oil, honey, and pasta. Biking or walking tours of Lucca and the surrounding area, a Tuscan cooking class, the Puccini Opera in Lucca, a night on the town to Pietrasanta Artists Village, Italian language lessons and cooking classes, shopping excursions, massages and holistic treatments at the spa, and more. You will need to be in Lucca for pickup by 3:30 pm on Saturday, May 9. This shuttle to the villa is included. Please consider arriving early and staying a few nights in Italy before we begin. If you wish to stay in Lucca I can send you a list of recommended hotels and B&B’s. If you are traveling alone, let us know and we will try to connect you with others in the group. Check out time is 9:30 am on May 16. I have a scheduled drop off at the Lucca Train Station included in the retreat cost.